(Lt.Col.) Dr.Y.Ashok,M.D,DA,DNB Consultant Anaesthesiologist, Ramesh Hospitals,Vijayawada, delivered guest lecture on "Basic life saving program" to the girl students of III/IV B.Tech (All branches),MBA,MCA of RVR & JCCE, and issued certificates to the 240 participants for attending the training on Basic Life Support (BLS) on 25/8/2018. Dr. K.Suresh Kumar, Professor&HOD, Dept. of Psychiatry, Katuri Medical College, Chinnakondrupadu, Guntur delivered guest lecture on "Stress Management" on 8/3/18 (Thursday), for IIIrd year B.Tech, MBA,MCA,M.Tech girl students of RVR & JCCE as part of the Women's Day celebrations. Certificates were also distributed for the prize winners, participants and organizers of the different events conducted during the academic year 2017-18 such as Femi- Quiz, Roll-Play, Miss Ethnic, Cervical Cancer Walk and Elocution Competition to encourage the girl students. The event "Elocution competition" on "Women Empowerment" such as "Women's equality : Fact or Myth" ,"Women as Entrepreneur" and "Building own Identity and vision of future" conducted on 8/3/18 (Thursday), in order to bring out the best and capable young women to share their views on related Issues. The 2nd year B.Tech girl students and LAC members of RVR & JCCE participated in "Cervical Cancer Awareness Walk-2018" on 24/1/2018(Wednesday) from Mother Theresa Statue, Lakshmipuram,Guntur to Ramesh Hospitals, Guntur which is organized by Ramesh Hospitals, Guntur, in association with FOGSI. Dr. A. Priya Nandana ,M.S,OBG, Ramesh Hospitals,Guntur delivered guest lecture on "Cervical Cancer Awareness" to the girl students of I/IV B.Tech, MBA, MCA of RVR & JCCE, on 6/1/2018. The Lady Advisory Committee conducted "Miss Ethnic" competition on 28/12/2017 (Thursday) in view of "Women's Day -2018" Theme: "Press for Progress" for girl students of B.Tech, MBA, and MCA of RVR & JCCE. Smt. B.Rama Devi, Art of living, Guntur conducted Workshop on the "Health and Happiness" to the girl students of I/IV B.Tech, MBA, MCA of RVR & JCCE, on 12th October 2017. The Lady Advisory Committee conducted ROLE-PLAY on "Women Personalities/themes" for all girl students of B.Tech, MBA, MCA of RVR & JCCE, on 19th September 2017. The Lady Advisory Committee conducted quiz competition (FEMI QUIZ-2K17) for girl students of B.Tech, MBA, MCA of RVR & JCCE, on 22nd July 2017. On the occasion of International Women's Day, celebrations were conducted on 8/3/2017, for the girl students and lady staff members. The event was marked by Group Discussion (GD) and Elocution on "Women Empowerment" such as "Be your own she Hero" and "Building own Identity and vision of future" in order to bring out the best and capable young women to share their views on related Issues. The girl students of B.Tech and PG along with lady faculty members interacted with eminent personalities, Smt. Mullapudi Renuka (TDP Leader) and Smt. Suchitra Ella (co-founder of Bharat Biotech) on women issues, at "National Women's Parliament - 2017" at Ferry Ghat, Pavitra Sangamam, Amaravathi, Vijayawada. The interaction was arranged and telecasted by ABN Andhra Jyothy TV channel on 12th February 2017. The girl students of B.Tech and PG along with lady faculty members in total 32 members have attended "National Women's Parliament - 2017" Organized by Andhra Pradesh Legislative State Assembly in association with MIT School of government,Pune at Pavitrasangamam, Amaravathi, Vijayawada during 10th - 12th February 2017. Smt K.V.Padmavathi, Legal Counselor, Domestic violence Act, Guntur delivered a guest lecture on the 'Violence against women-Safeguards-awareness of women laws' for the I/IV B.Tech & MCA girl students, on 22/9/2016. International Women's Day (8th March 2016) was celebrated in the college with a plethora of events that offered motivation, knowledge and entertainment to all the lady members of the college. Dr.G.Sudha Vani, Professor in ECE and convener of Lady Advisory Committee advised students to excel in their fields of interest and emulate great women of the past to achieve success in life. The highlight of the celebrations was the 'Ms Green' competition held in these segments: 'Green Attire', 'JAM', 'Quiz' on achievements of some internationally renowned women in different walks of life. A photography competition conducted with the theme "Women with Nature". Cumulative scores obtained in the two segments by the participants were considered for adjudging first, second prize members along with prize amounts. Women faculty members who received their doctorates in 2015-2016 and teachers who excelled in inter-collegiate sports and games competitions were felicitated on this occasion. Before the cultural session, Dr. M.Srilatha, HOD of CSE department and Dr.A.Sri Krishna, Head of IT department addressed the students with a thought provoking and motivating lectures, well received by the audience. The girl students enjoyed colorful cultural performance with wonderful dances and skits. A practice session on Micro Yoga, Pranayama and Meditation was arranged on 03/02/2016 for the benefit of all first and second year students of B.Tech, MBA and MCA girl students and lady faculty members by Sri B.Mallikarjuna Rao, a National Yoga Champion. A training program was conducted for I/IV & IV/IV B.Tech ,MCA and MBA girl students on First Aid and Basic Life Support by The Indian Women Network (IWN) AP & TS, confederation of Indian Industry (CII), Hyderabad, on 28/10/2015. Dr.V.Nagalakshmi, Vice-Chairman, (IWN & CII), Hyderabad explained the need for public awareness and the initiative to be taken for checking atrocities on women at vulnerable places like work stations, public places, in travel etc. Further, Dr.Sai Sandeep Gupta, Neurologist, Ramesh Hospitals, Guntur enlightened the audience with the measures to be taken for saving the lives of Brain and Heart attack victims. A Guest Lecture was organized for all branches of III/IV B.Tech , MBA and MCA girl students on Knowledge, Attitude and Practice for the Healthy Life style by Dr.M. Madhavi Latha, Associate Professor in Physiology from N.R.I.Medical College, Guntur, on 26/9/2015. A guest lecture was organized for I/IV B.Tech students on Stress Control by Sri Satya Gopinath Prabhuji, coordinator of ISKCON, South India and President of ISKCON temples at Guntur, Rajahmundry and Ananthapur, on 22/4/2015. International Women's day was celebrated on 8/3/2015. Convener, Lady advisory committee, Dr.G.Sudha Vani, welcomed all the young women of the college asking them to unleash their powers for a better future. She said that it is time to mobilize all people to do their part. Principal,Dr.A.Sudhakar, told that it is the time to reflect on the progress made,celebrate acts of courage and determination by ordinary women who have played an extraordinary role in the history of their countries and communities. Dr.Kota Srinivasu, Head ,Civil engineering department explained to the students the background of women's day and its importance. Dr.M.Sreelatha, Head-Computer science, Dr.A.Sri Krishna, Head-information technology, Dr.K.Sobha, Head-Biotechnology, and Dr. K.Karteeka Pavan, Professor- IT department gave pieces of advice to the young women. The event was marked by cultural activities and interesting competitions that left the day memorable for girls. Smt T.D.Vimala, Principal Govt Degree college, Guntur; presently working in ANU ,Guntur delivered a guest lecture on "Capacity Building of Women through skills" to IV/IV B.Tech girls students of RVR&JCCE on 12th August 2014. On the occasion of International women's day celebrations were conducted on 6th march 20s14 for all girl students and Lady Staff members the event was marked by speeches and cultural activities such as dance, singing, skit, etc.. that left the day memorable to the women. On the occasion of "International women's day" celebrations were conducted on 8th march 2013 for I/IV, II/IV B.Tech and PG girl students and lady staff members. "SILENT RALLY" condoning the Delhi incident, was conducted by all the staff members and students of RVR&JCCE on 3rd Jan 2013. 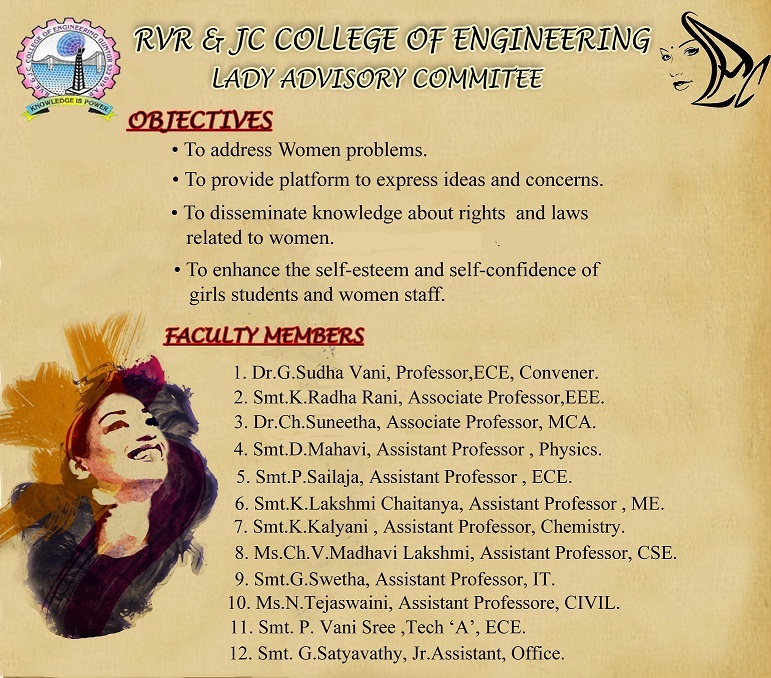 On the occasion of International Women's day a get-to-gather for the entire lady staff members of RVR&JCCE were conducted on 9th march 2012. Mr.Vallabhaneni Satish Kumar , Town Project Leader, M/S.Pioneer Automotives, Guntur delivered a guest lecture on "Road safety awareness" to the IV/IV B.Tech girl students of RVR&JCCE on 16th Feb 2012. Dr.P.Padmalatha, M.D., D.M. (Endocrinology) Associate professor in Medicine, Guntur Medical College, Guntur, delivered a guest lecture on "Hormones & You" to IV/IV B.Tech girl students of RVR&JCCE on 24th Dec 2011. Dr. Vanaja M, Assistant Professor in Department of Psychology, ANU, Guntur delivered Guest Lecture for I/IV B.Tech girl students of RVR&JCCE to counsel them regarding "How to face/solve Problems, how to mingle with the seniors" on 9th Dec 2010.